Orange Street school in Portsea. Now, what I want is Facts. Teach these boys and girls nothing but Facts. Facts alone are wanted in life. Plant nothing else, and root out everything else. You can only form the minds of reasoning animals upon Facts: nothing else will ever be of any service to them. This is the principle on which I bring up my own children, and this is the principle on which I bring up these children. Stick to Facts sir! Thomas Gradgrind had directed these remarks to his newly trained teacher, Mr M’Choakumchild. The national training of teachers was in its early stages and Dickens was critical of its over-emphasis on knowledge and facts and feared that teachers were systematically extinguishing creative and imaginative qualities in children. For the majority of children in Dickensian Portsmouth as elsewhere in the country, education was limited. With little direct State interference, schooling for children of the poor and working classes largely depended on churches, chapels and charitable organisations. For the more wealthy, a large number of private boarding schools and superior academies existed in Portsmouth and Southsea. Many of the academies were situated in the more affluent Southsea and were designed to prepare boys for the navy, army or civil service. Aged 13, Charles Dickens’s son Sydney attended Eastman’s Naval Academy in Eastern Parade where he spent a year before joining the training ship Britannia. The academy offered a wide syllabus including the Classics, Latin and French as well as introductory naval training for young officers in subjects such as navigation and nautical instruments. The additional delights of being close to the beach and the pleasure of sea bathing were also well advertised and the academy even boasted its own cricket team. By contrast many of the poorest children received no schooling, or, if they were fortunate, attended one of the few charity schools or a Sunday school. For those slightly better off and able to pay a small fee, elementary schooling was available in Portsmouth from 1812. In March 1871, following the Education Act of the previous year which, for the first time, legislated for mass elementary education, a special census was taken of all children in the borough. This found that 18,578 children between the ages of three and thirteen required elementary school accommodation. Boy’s school. This is held in the body of an old chapel and was founded in 1836-37. Average number of boys 110. There is no play ground. Ventilation is by 4 windows. There is an adjoining privy which discharges into a cesspool below the floor. The small urinal runs out onto the street gutter…the school itself is unhealthy, the ventilation is very bad and the room very dark…on my visit the atmosphere was very offensive with a damp musty smell. Girl’s school. This school is to the rear but on the same floor and in the same old chapel. The number of girls is 80. The privy is in a water closet upstairs, which is very inconvenient, and which flows into the cesspool of the Boys school. There is a small yard behind with a drain containing stagnant water which is very offensive…the odour is so bad and the drains swarm with rats, which often enter the school. 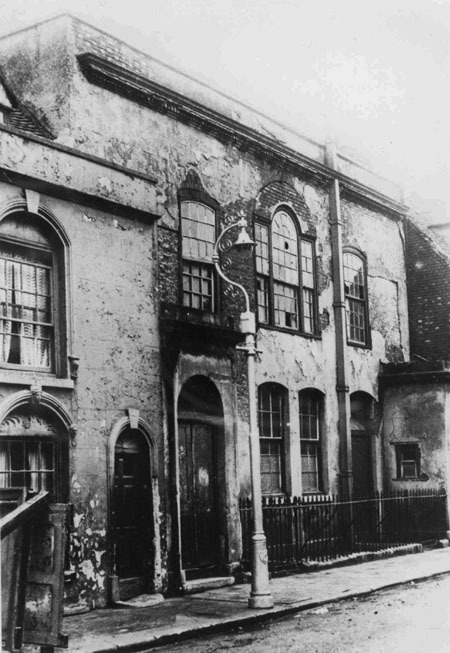 Portsmouth’s charity and ragged schools were located in some of the town’s poorest districts. Portsmouth Beneficial Society School, known often as “Old Benny,” was established in 1754 and ran until 1933. 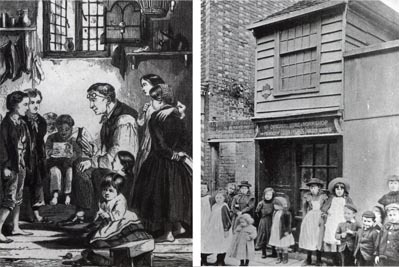 The Beneficial Society was set up by a group of local merchants and tradesmen to provide death and sickness benefits for themselves and free schooling for the poor boys of Portsmouth. The depression following the French wars meant the school struggled and fees were introduced although some free places were still retained throughout. The first Ragged School was founded by John Pounds (1766-1839) in Old Portsmouth. John Pounds is credited with initiating the national Ragged School movement. My first master was a Mr. Gladstair, a tall man, somewhat advanced in life, slightly round shouldered, and wearing a rusty suit of black, with a swallow tail coat. Mr. Gladstair was said to be a very clever man, and in proof of that, he was able to write the ‘Lord’s Prayer’ upon a piece of paper the size of sixpence. Whatever else he was clever in I have no recollection ….the subjects he taught were very limited…The good old Church Catechism was early taught…A good handwriting was the special thing…Mr. G appeared to be an easy going man, who was prepared to “let the world slide.” He was addicted to a very bad habit in the warm summer afternoons, a boy was sometimes despatched to the Public House opposite…for a pint of ale or stout, which Mr. G. placed on a desk near the Southampton Row side…and sipping now and then would soon begin to doze. As soon as that was noticed a general hum would be heard, from the talk of the whole 300 boys, this hum soon increased in volume until it became so loud as to awake the master, who would spring to his feet, give a violent blow on the desk with his cane and all would quiet in a moment. …the cane was invariably used …Sometimes it was administered on the palm of the hand, but more generally upon any part of the body right and left. At times for more serious offences there was a kind of military or naval punishment used, not with the cat but with the birch. The boy was made to strip or at least lower his braces, let his trousers down and received his dose in the lower part of the back, or as it was regularly termed his “backside” and the Doctor was summoned to witness it. Great solemnity was observed on these occasions…Two boys held each hand of the culprit, and he was pulled up tightly to one of those square wooden pillars, which support the Hall overhead…The disgrace of having to expose ones person was the principal thing in the punishment…People believed in punishments in those days, and it was not an uncommon thing for a woman to ask a Master to punish her boy for an offence committed at home. The first Ragged School in Portsmouth began was founded by John Pounds (1766-1839) who is credited initiating the Ragged School movement. Crippled as an apprentice in the dockyard, John Pounds became a cobbler in St. Mary’s Street. Here he would gather in around him forty or fifty of the local pauper children in his tiny workshop. He provided encouragement, taught them the rudiments of reading, writing, cooking and mending their shoes. He also took them on outings to Portsdown Hill where he gave them nature lessons. Pounds was a rough and ready character which no doubt helped him in his task to improve the outlook of the local ‘urchins’.